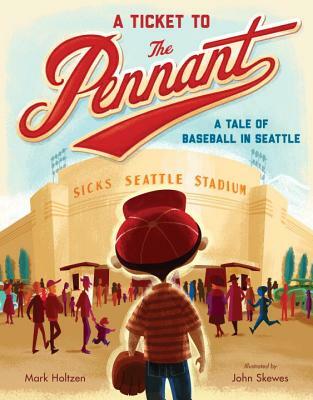 This nostalgic and historical picture book follows Huey through South Seattle as he retraces his steps through the charming neighborhood surrounding Sick’s Stadium to find his lost ticket--and follows him through the big game to victory. Neighbors from all different backgrounds listen to the game, announced by the beloved Leo Lassen, as Huey visits locally owned shops like the Italian bakery and the Japanese fish market. Featuring the vibrant retro illustrations by Larry Gets Lost series creator John Skewes, Ticket to the Pennant celebrates diversity and will be cherished by baseball fans young and old. Mark Holtzen and his family live in Seattle. He teaches third grade and wrote and published The Pig War, a novel set in the San Juan Islands. "Skewes’ bright, retro-flavored cartoons complement the text, vividly capturing the time and place as well as Huey’s changing emotions. Sweet and wistful nostalgia for a bygone era." "A 32 page celebration of a time when baseball was the only game in town." "Tour the Seattle of 1955 with Huey as he and his neighborhood cheer for the Seattle Rainiers." "People who know Seattle baseball or the Rainier Valley neighborhood will enjoy this trip down memory lane." "[A] great book about a much-loved aspect of the history of our area." "[A] gorgeous new picture book...featuring beautiful retro-style illustrations from John Skewes"